Wherever these New Jersey roads take you, you and your family can be sure to have peace of mind with our fast, friendly Roadside Assistance . Our superior towing services will make haste to save the day. Whether it’s a flat tire in Monmouth County, a dead battery in Middlesex County, or in need of an off road recovery in Ocean County, you can count on our fleet of knights in shining armor. 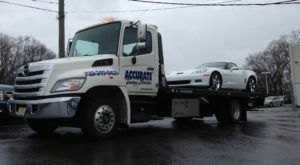 Accurate Towing has proven to be the most reliable and best priced towing service central New Jersey. We are located in Toms River but we have been known to save the day in Ocean, Monmouth, and Middlesex County. We know how inconvenient breakdowns can be, so we make it a point to treat our customers with a sense of urgency and understanding to help defuse the situation. Let our professional roadside technicians provide you with our outstanding towing services and you will understand what sets Accurate Towing above all the rest. No matter what problem you are facing, day or night, our trained professionals will provide the best emergency vehicle recovery service in New Jersey. Our goal is to provide the best priced towing service in the Central New Jersey Area. Our customers know they can count on our Roadside Assistance to come to the rescue any day, anytime and anywhere. If you are in need of a towing service, emergency vehicle recovery, or off road recovery in Ocean, Monmouth, and Middlesex New Jersey you can count on our professional technicians to act fast and offer you the best priced towing service in New Jersey.